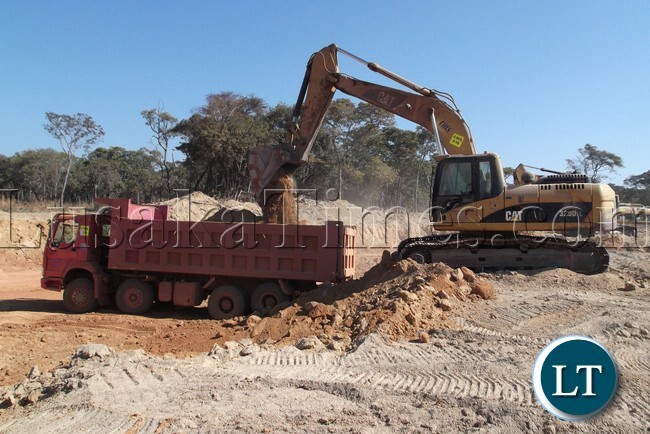 file:Road construction works along the 78 kilometre stretch of the pedicle road in the DRC. A team of engineers from Lualaba province in neighbouring Democratic Republic of Congo has arrived in the country to carry out inspection of the proposed routes for a a road construction to connect the two the two countries from Northwestern province. The joint team of engineers is today scheduled to inspection Kambimba border route in Mwinilunga district and continue with Kalengelenge border route in Kalumbila district tomorrow. Kambimba border route in Mwinilunga is about 266 kilometres and Kalengelenge border route in Kalumbila is about 140 kilometres, respectively from Solwezi town, the provincial capital for Northwestern. The team led by Lualaba manager in charge of studies for road, port and airports, Eric Ngilo arrived in Solwezi last evening and immediately paid a courtesy on provincial permanent secretary, Ephraim Mateyo who outlined their scope of inspection in collaboration with local engineers. Mr. Mateyo said equally a government team of engineers from Northwestern province will equally travel to Lualaba province at a later time to inspect the routes from the Congolese side.The visit of the Congolese engineers follows the signing of a bilateral cooperation framework on the proposed road connectivity project between Lualaba province and Northwestern province. Lualaba province vice governor, Fifi Saini and Northwestern province minister, Nathaniel Mubukwanu each signed the agreement on behalf of their respective provinces.Within the framework of the bilateral trade relations between the Northwestern province and Lualaba province, the two parties have agreed to construct a road from Kolwezi to Solwezi to connect the two provinces. The two parties have also agreed that the proposed road project be constructed through the Public Private Partnership singularly financed despite the two provinces having the discretion to procure their preferred contractors and consultants within the set terms of reference in consultation with the financier. The two parties further agreed that the financier identified by the Lualaba provincial administration be allowed to finance the road construction and one stop border post infrastructure on both the DRC and Zambian sides.It was further agreed that a team from Lualaba be sent to Northwestern province to conduct a combined assessment of the road on the Zambian side with the Road Development Agency. Both parties have also agreed to cooperate in areas of mining, agriculture, fisheries and tourism development. I just hope this is doable with the Congolese and hope, those Engineers don’t bring into Zambia Ebola together with their Rhumba music. Otherwise such ideas, good as they maybe in business terms, should have been done years ago. YES LET US MORE CONNECTIONS WITH OUR NEIGHBOURS TO REKINDLE OUR CULTURAL CONNECTIONS AS WE ARE ONE PEOPLE!! Lualaba Province (part of the greater old Katanga) has the same ethnic mix as North Western Province, similarly Haut Katanga and Tanganyika Provinces (all part of the greater old Katanga) has the same ethnic mix as the Copperbelt, Northern part of Central and Luapula Provinces!! WE JUST HOPE FOR PEACE IN DRC SO THAT THESE ROUTES CAN BE USED FOR TRADE,TO REDUCE POVERTY AND PROMOTE CULTURAL THROUGH PEOPLE TO PEOPLE CONTACTS AND NOT TO FACILITATE EASY ESCAPE FROM STRIFE!! Let’s roll, it will never have chance! We are in a hurry to develop this thing! THIS IS VERY GOOD FOR BUSINESS GROWTH…..IT SHOULD HAVE HAPPENED QUICKER….